University of Houston researchers have reported a new way to raise the transition temperature of superconducting materials, boosting the temperature at which the superconductors are able to operate. 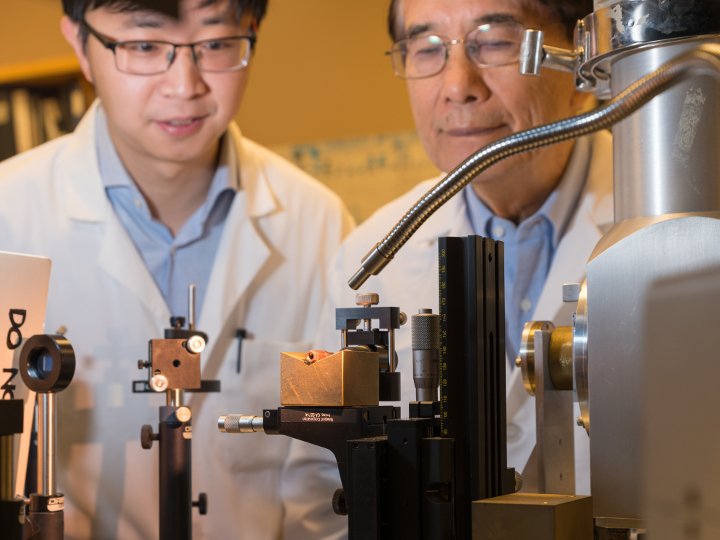 Researchers Liangzi Deng, left, and Paul Chu, founding director of the Texas Center for Superconductivity at UH, examine a miniature diamond anvil cell, or mini-DAC, which is used to measure superconductivity. Image Credit: Photo by Audrius Brazdeikis, University of Houston. Click image for the largest view. Electric current can move through superconducting materials without resistance, while traditional transmission materials lose as much as 10 percent of the energy between the generating source and the end user. Finding superconductors that work at or near room temperature – current superconductors require the use of a cooling agent – could allow utility companies to provide more electricity without increasing the amount of fuel required, reducing their carbon footprint and improving the reliability and efficiency of the power grid. Chu, a physicist and TLL Temple Chair of Science at UH, said the current record for a stable high-temperature superconductor, set by his group in 1994, is 164 Kelvin, or about -164° Fahrenheit. That superconductor is mercury-based. The bismuth materials tested for the new work are less toxic, and unexpectedly reach a transition temperature above 90 Kelvin, or about -297° Fahrenheit, after first predicted drop to 70 Kelvin. The work takes aim at the well-established principle that the transition temperature of a superconductor can be predicted through the understanding of the relationship between that temperature and doping – a method of changing the material by introducing small amounts of an element that can change its electrical properties – or between that temperature and physical pressure. The principle holds that the transition temperature increases up to a certain point and then begins to drop, even if the doping or pressure continues to increase. Liangzi Deng, a researcher at TcSUH working with Chu and first author on the paper, came up with the idea of increasing pressure beyond the levels previously explored to see whether the superconducting transition temperature would increase again after pressure dropping. The superconductor samples they tested are less than one-tenth of a millimeter wide. The researchers said it was challenging to detect the superconducting signal of such a small sample from magnetization measurements, the most definitive test for superconductivity. Over the past few years, Deng and his colleagues in Chu’s lab developed an ultrasensitive magnetization measurement technique that allows them to detect an extremely small magnetic signal from a superconducting sample under pressure above 50 gigapascals. Deng noted that in these tests, the researchers did not observe a saturation point – that is, the transition temperature will continue to rise as the pressure increases. Its been a while for superconductor news. While this isn’t a breakout it does strongly hint on how research should continue. The field isn’t going at great speed, but we are really a very long way up from absolute zero (−459.67 °F). Installations of supercapacitors are taking place in some very special fields such a electromagnets. Its very encouraging news even in the face of such a long way to go.